Water is a subject that is on people’s minds. 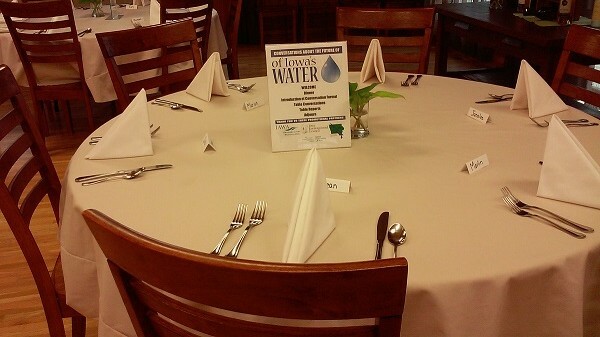 The Wallace Centers of Iowa and four promotion partners are encouraging people to talk to each other at Conversations about the Future of Iowa’s Water. At the dinners, dialogue is structured with questions that naturally bring about four civility practices. These practices are taught in The Wallace Centers of Iowa programs for the workplace. In order to understand issues better, it makes sense to explore what feels troublesome about an issue. Eventually a person will need to speak up in order for things to change. When it comes to the future of Iowa’s water, what are your concerns? When a person speaks, they have a right to respect and to be heard. Listening well involves asking questions to understand and truly acknowledge what others are saying. Thinking about the future of Iowa’s water, have you listened to the concerns of other Iowan’s? No matter what issues come up, there are always positive examples of people taking action. Being able to see those examples and build on them creates a more civil society. What positive actions have you seen that address the future of Iowa’s water? Each person must assume some level of responsibility in order for any kind of civil action to occur on a larger scale. In the case of the future of Iowa’s water there are two questions to consider about responsibility. What role do elected officials have to play? What personal actions have you taken or plan to take to improve the future of Iowa’s water? Discussing questions in a small setting, after getting to know new people over dinner, is a simple but profound experience. 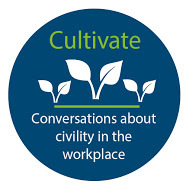 Seeds of Civility is a blog that cultivates conversations about civility and leadership in the workplace and in the community. Keep the conversations going! Previous Seeds of Civility posts have discussed the difficulty of staying open when our deeply held beliefs are questioned. Based on our brain design, we want to leave or engage in defensive behavior. These two options are not helpful when we live in a diverse world. Practically, we need to know how to work and live in communities with others who have opposing points of view. Real world examples are the best way to learn. On Dec 31, 2014 The Des Moines Register published an insightful story on about two political activists, Donna Red Wing of One Iowa, and Bob Vander Plaats from The Family Leader. Red Wing and Vander Plaats have strongly opposing views about marriage. Red Wing and Vander Plaats have been meeting every few months for over a year now, for an hour at a time, with no agenda or talking points. They talk about their families, religion, politics. They share an outrage over human trafficking and payday lending. He appreciates her love of children and says she appreciates his service to special ­needs people. There are lessons to be learned from the two advocates as they stayed true to their beliefs yet sought out conversation and dialogue. These are not rules, they are simply lessons learned from the powerful example of Red Wing and Vander Plaats’ story. Goal – If you decide to spend time listening to another side of an issue, have a goal in mind that is greater than trying to change the person’s mind. Listen – Treat the other person with same respect you would like when it is your turn to speak. Think about it: Would you consider engaging in this kind of dialogue? Share your thoughts below or at @seedsofcivility. 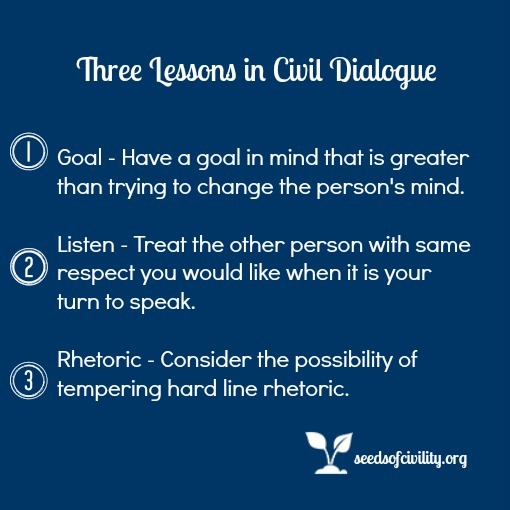 Seeds of Civility is a blog that is created by The Wallace Centers of Iowa. Here we cultivate conversations about civility in the workplace.